This privacy notice provides you with details of how DATA:Scotland (SQLGLA Ltd) (“we”, “our” and “us”) collect and process your personal data through your use of our site DATAScotland.org, including any information you may provide through our site when you register or purchase a ticket for an event, sign up to our newsletter or take part in a prize draw/competition. SQLGLA Ltd is the data controller and we are responsible for your personal data. Personal data means any information capable of identifying an individual. It does not include anonymised data. Using your information allows us to provide you with a better experience when using our website and services. Financial details when payments are required (e.g. payment for event exhibition stands or tickets). 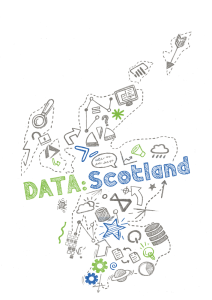 We may contact you from time to time via email to request your feedback on events and/or services you receive from us, or to send out surveys related to DATA:Scotland’s services. You can subscribe on the website to receive further information from us including news and events updates. You can withdraw your consent at any point by clicking on the ‘click here to unsubscribe’ link provided in our emails or by contacting us directly. We will process information about you to administer your event attendance, and after the event, to send you information such as photos/video of the event, presentations or follow up events by email. You will be asked to consent to such activities as part of the event registration. We also collect some personal data, such as the IP address of your computer, through the use of website cookies. You can set your preferences for these cookies through our cookie banner. A cookie is a small data file that certain websites write to your hard drive when you visit them. The only personal information a cookie can obtain is information a user supplies him or herself. A cookie cannot read data from your hard disk or read cookie files created by other sites. Cookies, however, enhance our website performance in a number of ways, including providing a secure way for us to verify your identity during your visit to our website and personalising your experience on our website, making it more convenient for you. These cookies are essential to enable you to move around the website and use its features. Without these cookies, we cannot provide some of the basic functionalities of our website. These cookies generally collect information about how visitors use our website, for instance which pages visitors go to most often, and the pages that they do not. This helps us to understand and improve the site, so it is easy to use and includes helpful content. They also allow us to fix bugs or glitches on the website. These cookies do not collect information that identifies visitors, so we cannot identify you individually. We use Google Analytics to track usage of our websites and interaction with our newsletters. For example, to see what content you click on, so we can analyse what content is of most interest to our audience. You can restrict or block cookies which are set during your use of the website by changing your browser’s settings. Some pages may not work if you completely disable cookies, but many third party cookies can be safely blocked. Check information in your browser’s help section for specific instructions on how to manage cookies. Alternatively, websites such as “All About Cookies” provide comprehensive guidance. To help provide our services, we occasionally provide information to other companies that work on our behalf. We may pass your details to other companies that provide services for us. They may only use your details in the provision of the service to us. We use MailChimp for our email distribution. In addition to mailing preferences that you can manage here we will upload data that we hold about you to MailChimp, that we require in order to be able to email you (Name, Company, Email Address) about an event you are registered to attend, or when you have opted-in to receive emails about future events from DATA:Scotland during your conference registration. If you wish to unsubscribe from receiving emails about upcoming conferences and other information we think you’d find useful, then click here. You can find the MailChimp privacy details here. Please be aware that we do not have any control over third party websites and that such third-party websites may send their own cookies to users, or otherwise collect data or solicit personal information. By law we must keep basic information about our customers (including Contact, Identity, Financial and Transaction Data) for six years after they cease being customers for tax purposes. All individuals have rights under data protection laws. However, they do not apply in all circumstances. If you wish to exercise any of them, please contact our Data Protection Officer (details provided below) and we will explain at that time if they are applicable or not. We will inform you in writing following receipt of your written request and if necessary, seek additional information from you about your request, including proof of identity. The right to request access to your personal information, be informed about the processing of your personal information and receive a copy of the personal information we hold about you. We are obliged to respond to any such request within one month of receiving a request, subject to limited exceptions. The right to withdraw your consent to processing (if consent is relied upon by us to process the personal data). At all times, you have the right to complain to the Information Commissioner’s Office which enforces data protection laws: https://ico.org.uk/. Unfortunately, the transmission of information via the internet is not completely secure. Although we will do our best to protect your personal data, we cannot guarantee the security of your data transmitted online or through the website. Any transmission is at your own risk. Once we have received your information, we use strict procedures and security features to try to prevent unauthorised access. Our Data Protection Officer oversees privacy related matters. Any questions about this privacy notice should be directed to the Data Protection Officer using the contact details set out below.